Even though I get a lot of questions about cashew-free dessert alternatives, I normally love my cashews and work with them plenty. This pistachio cake didn’t happen because I was trying to avoid cashews, but precisely because pistachios are one of the most satisfying (and prettiest) little nuts, and I wanted to highlight them in this dessert. Wouldn’t you say that that’s true? :) Pistachios are so vibrant and beautifully adorned, and in turn beautifully adorn many-a-treat. That, and they’re delicious, which helps a great deal. Yep, if you ever handed me a bag of pistachios, I’d definitely do a good happy dance. This cake is really lovely — very simple, but the flavor of the pistachios comes through nicely. And the color they lend to the filling is also very gentle and pretty in real life. But I sort of enjoyed it as a slice. I don’t know if it’s psychological, but cake feels a little more like a special occasion thing. A slice feels a lot more up to snuff when it comes to a mid-week treat, wouldn’t you say? Quick note: this recipe is for a smaller cake. See downloadable size guide below to help you size the recipe up if needed. 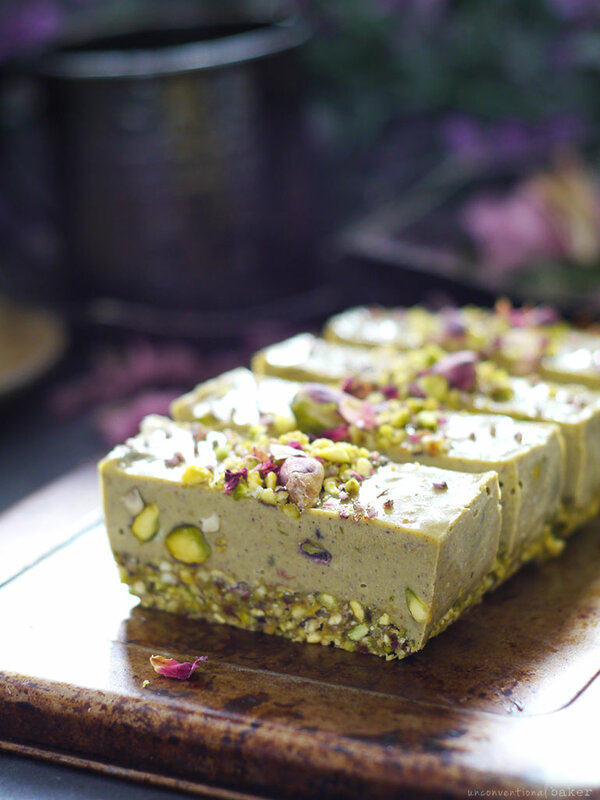 Simple, cashew-free raw vegan cheesecake slice, made with mild sweet pistachios. Gluten-free, rich, delicious dessert with a gorgeous green color. No dairy. Process all crust ingredients in a food processor into a sticky crumbly mixture. Transfer into a small parchment-lined tupperware container (I used one that’s 3″ x 5.5″) or a 5″ springform pan and press down into a flat even crust. Freeze while working on the next layer. Make sure all filling ingredients are at room temp. Blend everything, except the additional 1/4 cup pistachios, in a high power blender into a smooth uniform consistency. Fold in the extra pistachios with a spoon. Transfer the mixture into the prepared crust. Sprinkle with desired toppings. Freeze for 5-6 hours or overnight to set. Slice and enjoy! Keep leftovers frozen. 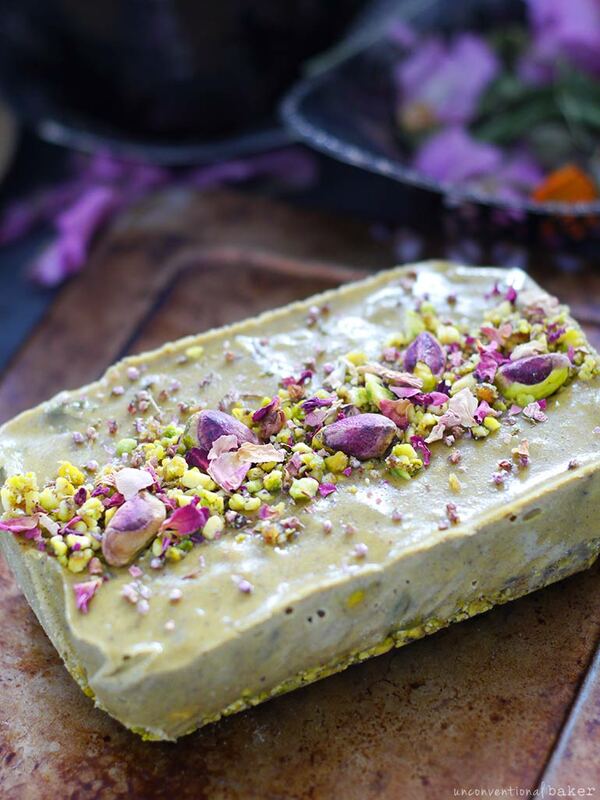 Unlike many of my raw cake recipes, in this recipe I did not pre-soak the nuts as pistachios are quite soft naturally so they blend well if you have a powerful blender. But if you suspect your blender might struggle, follow the below soaking procedure. I recommend tasting the batter as well in that case before pouring into the mold and adjusting sweetness, as nuts tend to become less sweet when soaked. To pre-soak nuts: place in a glass bowl, cover with water, and leave to soak for 4 hours (or overnight in the fridge). Then strain and discard the water. For a quick pre-soak, cover with boiled water and soak for 15 mins, then strain and discard water. (Note: this technique doesn’t preserve the nutrition of the recipe as well as the traditional soaking technique above). Note: the purpose of soaking the nuts is to re-hydrate them and plump them up for blending into a smooth, cheesecake-like consistency. Proper soaking techniques also maximize nutrition and digestibility. 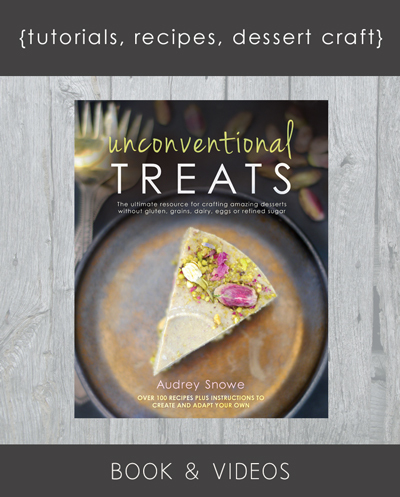 If you’re interested in learning more about nut soaking and other dessert prep tips and tricks, I delve into these subjects in detail in my book Unconventional Treats. Note: this post contains affiliate links to the blender, cake pan, and petals I used to make this cake. That’s awesome — thanks for the great feedback, Leanne :) I’m so glad your family has been enjoying these! I made this today, I had to double the recipe as I was using a larger sized slice pan. Can you tell me why mine does not look a lovely shade of green like yours does?? I did not soak the pistachios. Hi Vanessa. I’m guessing it can come down to the color of the pistachios. I find some batches I buy are super bright and green, while others are more of a yellowish-gray. Also I’m not sure if you switched any of the ingredients at all, but sometimes using a darker liquid sweetener (like for example coconut nectar or date syrup) can result in a different shade of cake. 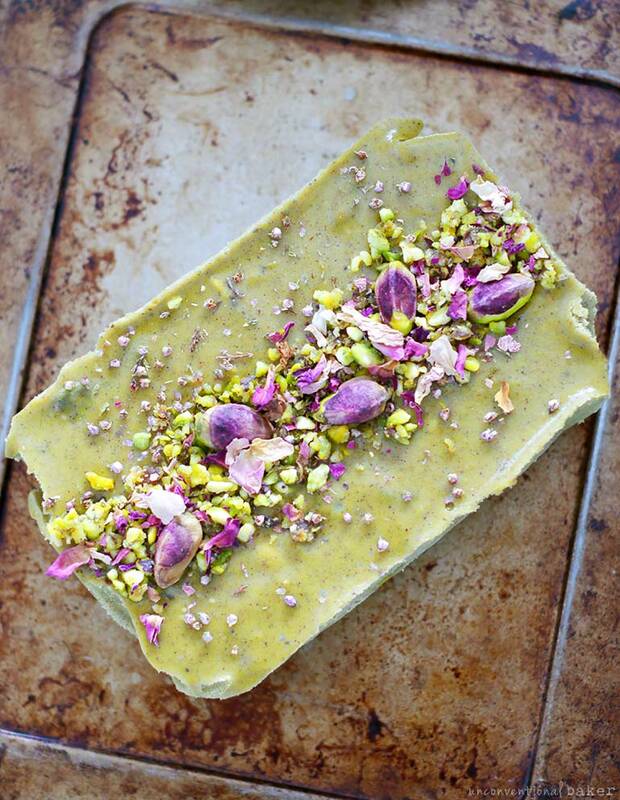 I loved the raw pistachio slice I made using your recipe. My whole family (4) said it was their new favourite! It was so rich and so delicious. We only ate half of it and saved the remainder. I’m looking forward to finishing it off. I imagine I can do lots of variations on this concept. Thanks very much for sharing. Have you ever tried using fresh Johnny Jump ups instead of the dried petals shown here? Having never made a raw cake/dessert, I was wondering if this slice would be suitable for a high noon tea that will be out on display for 2-3 hours or even 4 hours? I wouldn’t want it to ‘collapse’ and go runny on me. Especially when I am hoping to impress my skeptical friends with healthy alternative, vegan cuisine. I am aiming to included it as a 3cm ‘petite four’ serving size. I expect ambient temperature to be 20-22, degrees Celsius on the day. No, unfortunately it won’t hold up long in that temperature. 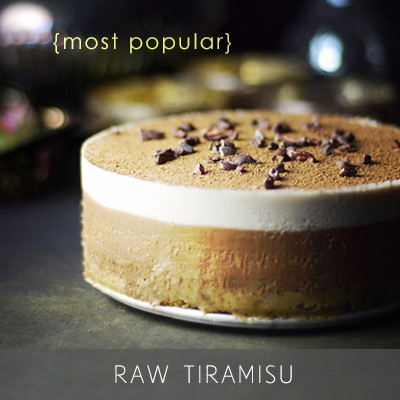 Typically raw cakes are served just slightly thawed out of the freezer. They can be thawed out for 10-20 mins at room temp and then it they slowly start to melt, as it’s the frozen coconut oil / cacao butter that keeps it together. So I usually thaw for 10 mins, slice and serve. Doesn’t sound like this would work for this situation — something baked would be more suitable. You could try this baked cheesecake. It holds up well at room temp and can be topped with fresh fruit and flowers for a “fancier” high noon tea look. This chocolate cake is another option and is a favorite at parties. This pistachio rose bundt cake could be another good option. Thank you, Audrey! I am so pleased I asked! I am grateful for your response. I have checked out your other suggestions and look forward to trying them out! You’re welcome :) Hope the tea party goes well. This looks so good! But… I’m really craving hazelnuts. I noticed you mostly use cashew in raw cheesecakes, but would hazelnut work as well? Thanks for your all of your amazing recipes! -they have a very mild flavor that’s most reminiscent of cheesecake in a recipe out of all the nuts. 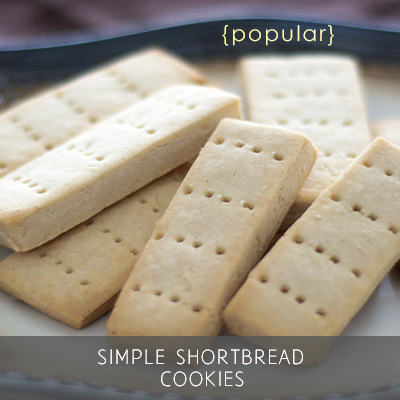 -they have a natural sweetness which allows for less sweetener to be used. That said, other nuts can definitely be used — as you see in this recipe it’s just pistachios. But the flavors and sweeteners need to be adjusted accordingly each time, depending on the nut used and the flavor desired. Hazelnuts can work well, but need more sweetness usually, and also another good flavor to take off the strong “hazelnutty” edge. So happy you liked it, Mary! Thank you for the feedback. Absolutely fabulous dessert! I loved how easy it was to make this great looking green goodness. It tasted amazing also. Thank you, Audrey! Thank you so much, Lana! You are so sweet for sharing :) I’m glad you enjoyed it! This so gorgeous. 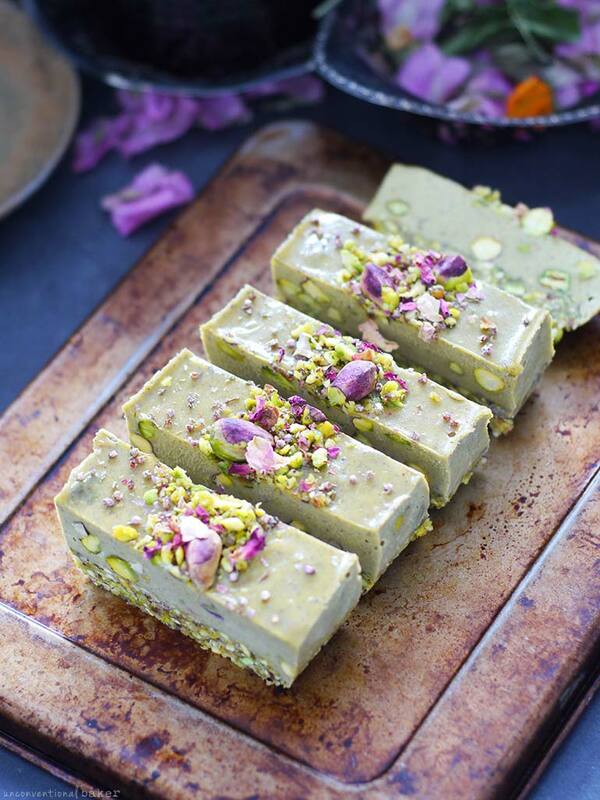 It’s National Pistachio Day in two weeks – a perfect dessert to make then!!! 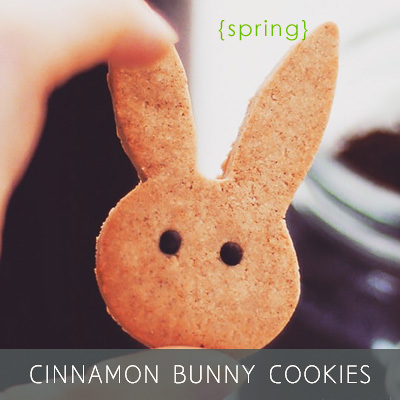 So cute and delicious looking, Audrey! Your recipes look wonderful! I can’t wait to make one. I look forward to doing so after the spring semester is over, but I have to ask… why do you use coconut oil so much? It’s very high in saturated fat. There are other oils that are much healthier. 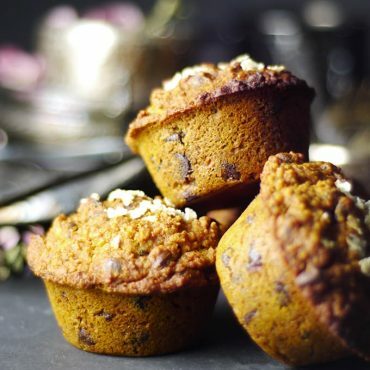 I like using coconut oil specifically in some of my raw cakes because of its unique properties — it solidifies very nicely when chilled and gives the cakes good stability and texture. Another oil that functions similarly would be cacao butter, but I reserve it for cakes where I want the cacao flavor to be present. Other than that, other types of oils just don’t have the same functionality when it comes to raw desserts. 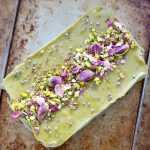 That said, I do make many raw cakes and raw treats without oils, which you can find under the oil-free section on the recipes page. I’m also working on adding a coconut-free section since many people have been asking for it. Thank you for that explanation! That does make sense to use it more for those reasons. I was thinking that it was used as a healthy alternative to other fats. Thanks! I definitely don’t think coconut oil is necessarily healthier than other oils — I just use it more for its properties when I feel its needed. If it can be avoid it, I usually leave it out. I do love its versatility though, and in moderation it’s an ingredient that can make many great treats possible. This looks divine! I am going to make this for my father, who recently started a diet to eliminate inflammatory foods. Sadly, for him, this includes coconut and coconut products. 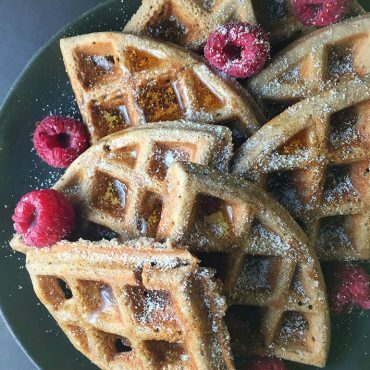 What would you suggest as an alternative to the coconut oil in this recipe? Many thanks! Otherwise, if you still want to work with this recipe specifically, you can try taking out the coconut oil, add in half an avocado, and replace the almond milk with lemon juice (it helps to keep the avocado from browning). For the crust, you can just omit the coconut oil altogether and add an extra date or two and you’re good to go. So sorry I missed your question earlier. You can forgo the lemon juice, but the cake will need to be eaten in one sitting. The lemon juice prevents the avocado from browning too quickly (which happens when the cake thaws out). So long as you’re planning on serving it in one go, I’d say you’re good.